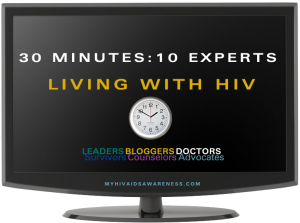 Our new video is called Thirty Minutes: Ten Experts on Living with HIV. We asked ten experts what is the one thing they would like to share about living with HIV. We asked for one single topic so viewers could hear what these experts – ranging from doctors to advocates to community leaders to bloggers to survivors - think is most important to know. There is a lot to consider each day when living with HIV. It is a complex disease. Sometimes it is just nice to provide simple answers. 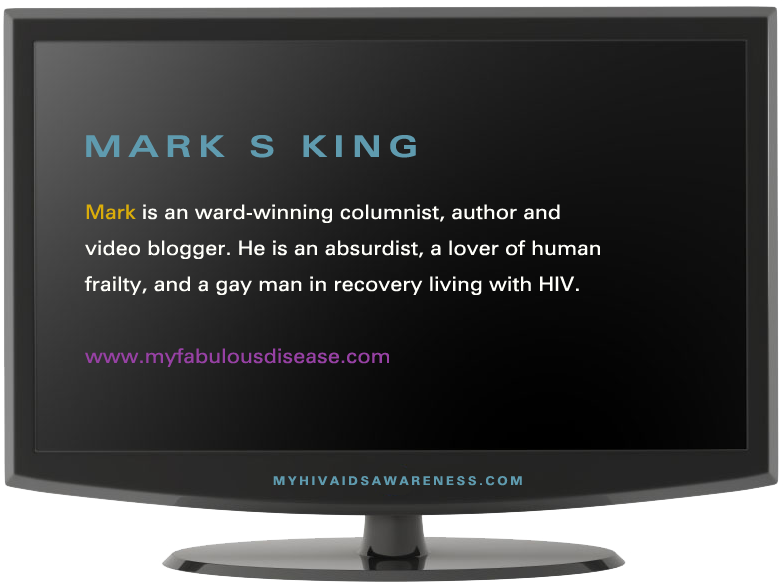 The video has been designed to introduce Kelly Markell, the father of an HIV positive son and founder of MyHIVAIDSAwareness.com. Kelly will be the host to introduce each of our experts and then share their two – three minute video clip. We will provide a little background information on each expert, hear from them, and then provide a quick summary of their topic. An action guide that summarizes the topics will be available to all viewers of the video. We all know that we learn much more effectively when it is an experience that we are actively involved in. Everyone who downloads and/or views the video will be provided with a ten day action guide to set up new daily habits that reinforce the information that our experts have shared. Each viewer will be invited to download a coupon to select a free eBook from our HIVantage Point series. The Thirty Minutes – Ten Experts video will be provided at no charge to visitors to our web site, schools, ASO’s, community organizations, and other non-profits. The purpose of this project is to increase awareness of the real issues of HIV coming from those who are fighting this disease on the front lines. Any footage that you provide will be used solely for the purposes of this specific video. By submitting your video, you are granting Kelly Cares LLC permission to use your footage solely in the Thirty Minutes – Ten Experts video. You will be provided a copy of the final edit for your approval. Video segments are two – three minutes long, They should reflect one single topic that you feel would fit under the statement, “the most important things to know about living with HIV.” Please feel free to choose your topic from any aspect of living with HIV. We are describing your participation as that Kelly asked each expert to grab a video camera and film whatever came to their minds when given this opportunity to speak directly to you. There’s no script, no rehearsals and no production crew. This is HIV reality. Please explain your topic of choice and why you feel it is so important. Inspirational thoughts and words of encouragement are definitely welcomed. We request that you to provide your raw footage shot in news interview format (chest up) and we will edit it into the final format. All videos should be in SD and can be shot from a standard digital video camera. (This footage does not need to be professionally shot.) We welcome multiple takes and our video team will handle any rough spots. A short bio is also needed to prepare your bio page in the video. The requested date of submission is on or before November 25, 2010. We would like to release the video on December 1, 2010. If there are any questions about this project, please contact Kelly Markell @ kelly-cares@myhivaidsawareness.com. Your participation is greatly appreciated and your agreement to shoot this footage yourself even more appreciated. We are a self-funded project and believe it is a more efficient use of our resources to get this much needed information and action plan to those who truly need it.